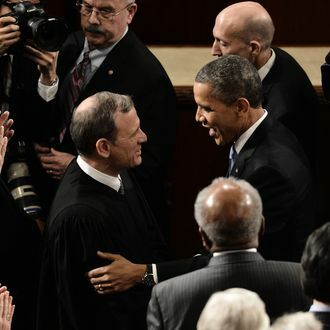 In oral arguments over the president's immigration initiative, Roberts did not look so friendly. In the run-up to today’s oral arguments in the Supreme Court, the tangled substantive and procedural issues contained in the case of U.S. v. Texas — a challenge to Obama’s plan to legalize millions of undocumented immigrants — had given way to a largely political question: Would Chief Justice John Roberts again save the president’s bacon on a major initiative, this time citing problems with the plaintiff’s standing to bring the suit? Some prior decisions by Roberts on standing, along with his well-established tendency to decide politically fraught cases on the narrowest possible grounds, led the New York Times’ Adam Liptak to quote several experts on both sides of the immigration issue as predicting Roberts might steer the evenly divided Court away from a substantive decision. There was little indication at the Supreme Court on Monday that President Obama has found needed conservative support to revive his stalled plan to shield millions of undocumented immigrants from deportation and give them the right to work legally in this country. Instead, the court’s conservatives and liberals seemed split, and a 4-to-4 tie would leave in place a lower court’s decision that the president exceeded his powers in issuing the directive. It could affect about 4 million undocumented immigrants who have been in the country since 2010 and have family ties to U.S. citizens and others lawfully in the country. Oral arguments are sometimes misleading, and the bigger question may be whether the Court defers disposal of this case until a ninth justice is confirmed. At a minimum, the signals issued by the Court today will add to the tangible stakes of the presidential election via a reminder of how one justice can make all the difference in the world to the lives of real people. And for John Roberts, the conservative conviction that he is an incorrigible Obama-loving traitor to the cause will receive a stay.